** A Journey of Self Awareness Email Program - Awaken to new dimensions of who you are! 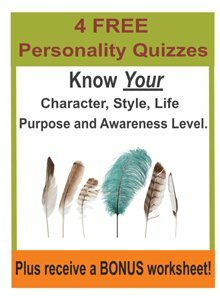 ** KNOW Yourself Workbook - Find out "Who Am I?" Defense Mechanisms List - What are your defense mechanisms? Indexer, Tracker Tool - Measure what is important to you. See how you are progressing. Stream of Consciousness Tool - Awaken your awareness. Feeling Finder Tool - Add more dimension to your feeling nature. ** 'intuit and DO IT' Manifesting Methods Email Program - Create your own manifesting system that works for you. ** Goals on One Page - Clarifying what I want in life. ** Get Control Email Program - Clarify your goals and manage your minutes with 90 days of emails. Dream Day Tool - Idealize your perfect day, week, month, year so you can begin to live them. "Be Smart" Goal Setting on One Page - A success formula for setting goals. Log Sheet Tool - Create order out of chaos. Hot List Tool - Keep handy your list of most important things to journal about. Creed/Manifesto Tool - Be clear about what you want, who you are, where you are going? Action Quotes - Do you act on inspiration? Planning Quotes - Make today count! ** Unraveling Subconscious Shadows on one page - What are your challenges and life lessons? 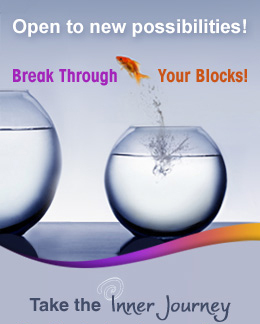 ** Block Busting Workbook - Build self esteem and break through challenges. ** Feeling Finder Email Series - Clearly identify your reactive emotions, its cause and its cure. Top 10 Rules of the Subconscious Mind - Why you are manifesting perfectly 24/7? Ego is List - How does your ego control you? Subconscious Influences List - What influences who we are? Modeling Tool - Often the indirect route is the best route. Art Work Tool - Allow your inner artist to share its wisdom. Poetry Tool - Let the beauty and rhythm of words share their feelings. Imagery or Captured Moments Tool - Re-experience the depths of peak events. Fears Quotes - Fearful? That's okay - You can handle it! Stress Quotes - Stressed out? Create space! ** Creativity Tools on One Page - This single page will give you lots of new ideas. ** Develop the Mind Email Series - Expand your creativity. Open the door to higher intuition. Top down, bottom up connections Tool � Ground the abstract and find purpose and meaning in the details. Intuitive Resonating Tool - Give a voice to your unconscious. Allow Alliteration Tool - Instigate infinite important informative ideas. Rhyme Time Tool- Find and unwind your kind mind. Metaphors Tool - There are many creative ways to say the same thing. Perspectives Tool - See things differently and make new inner connections. ** Meditation Email Series - Explore the right type that works for you. Stillness Questions - Still your mind and busyness and still your life! ** Maintain Balance Email Series - Stay on top of control, emotions, creativity, spirituality and money. ** Manifesting on One Page - 9 steps to creating what you desire. Self Improvement Tools - The secret tools to your success. Manifesting Quotes - You are a creator! ** Unravel Subconscious Shadows on one Page - What are your challenges and life lessons? ** Healing on One Page - Focus on healing the past and feeling better about yourself. ** Tame Emotions Email Series - Break through what holds you back with our 90 day email program. Healing Quotes � A learning and integration process. Healing the Past with the 4 E�s Article - Heal the past by working with your imagination in the present. Regular Check-ups Tool - Regular Check-ups help us stay aware of all aspects of our lives that matter to us. ** Manifest Prosperity Email Series - Build a progressive foundation over 90 days for increasing self worth and net worth. Money - What is it? List - What do you semi-consciously believe about $? ** Open to the Divine Smart Question Coaching Emails - Practice daily spiritual living with 90 days of smart question emails. ** Life Purpose on One Page - Clarify your direction and destiny in life. ** Meaningful Models of Consciousness - The consciousness path has been well defined, as you will see through these common models of consciousness. ** 2 Step Journeys Email Series - We describe the two yin and yang dance steps of life - awareness (experiencing) and manifesting (anchoring) in 30 unique and catchy ways. ** 3 Levels of Consciousness Growth Email Series - Use 30 memorable 3-word mini-journeys to identify and clarify your primary level of consciousness at this time. ** ABC's to XYZ's Email Series - You'll be amazed by these easy, fun alliteration emails that go through the alphabet to identify the processes, pains and potentials on our life path. Soul - What is it? List - How do you experience Soul? 5 Why's Guys Tool - How to go deeper to find the truth. Joy Quotes - Find your joy! What's the big picture for your life? Article - Challenges make more sense from bigger perspectives. Decision Making Criteria List - A customizable spread sheet for making clearer, more creative and more fun choices. What's Your Next Growth Step? - A guide to what to take next. Choice Quotes - What are you choosing for yourself? Steppingstones Tool - Create a meaningful life history log. ** Build Healthier Relationships Smart Question Coaching Emails � Explore your role in the dynamics of connecting with the important people in your life. Discover how you can find more satisfaction and fulfillment with others. Receive 20 emails over 40 days. Challenged by Your Relationships? Good! Article - See how your soul is the underlying guide to all relationships. Unsent Release Letters Tool - A very healing way to let go of the past. Surrender Quotes - Surrender to higher guidance! Forgiveness Quotes - The first step to forgiveness.